Content creation can be quite daunting and crafting the perfect post to keep your small business’ followers engaged with your Facebook page is very important, especially when research shows that Facebook is the number one tool used by small businesses and customers to communicate. 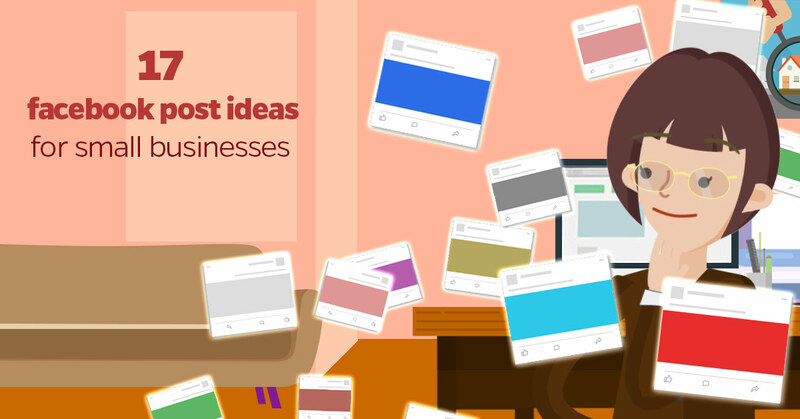 Here’s a list of 17 post ideas to get you inspired, try out for your brand, and boost your Facebook game. The activity of telling and writing stories is ancient and has been used as a mean to pass on information, traditions, to engage and share; people love to hear stories, to feel involved in your experiences and be part of what you do. 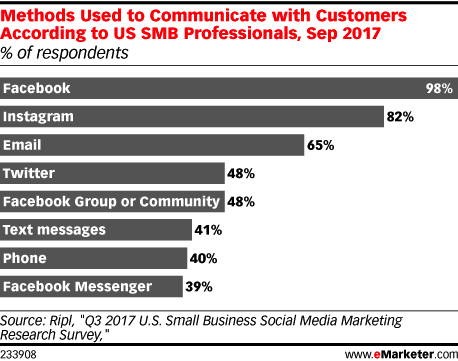 That’s why using stories as an idea to implement as part of your Facebook posts does wonders for your small business. Let’s take Humans of New York as an example, the page is filled with short and long stories that keep their followers engaged and this formula has helped the brand grow. Giving your followers and customers an idea about what happens behind the scenes in your small business humanizes your business and allows them to empathize and relate to your activity through your Facebook content. Of course, you shouldn’t base a big business decision on your social media following but asking them about some details, like a small change to your e-commerce or whether or not you should participate in something is a great way to engage with your customers and get their insight. 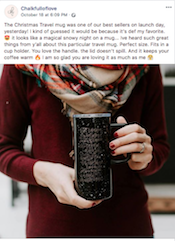 Give your followers a good idea about the products you’re selling by showcasing them through photographs or videos of them being put to use. Here’s an example that not only shows the product entirely and its the center of attention but also the details around it make you feel warm, as the season and the usage of it should make you feel. Memes and GIFs have become an essential part of the internet culture, understanding and using them is the internet’s version of being part of the cool kids as they’ve become quite popular, so give it a try if your brand is playful and allows for this kind of content. As a small business, you should keep in mind that any image could be copyrighted, a great approach to memes for your Facebook post ideas is to mimic them by creating your own pictures and adapt the message to your own. Holidays and festivities are essential all over the world, they may change topics or dates, but they’re very relevant to the culture and life of your customers so consider making them part of your content as a way to further bond with them. You may make good use of the posts to enforce your brand positioning, making content regarding your logo, your brand’s colors, or anything regarding your brand identity. Creating creative content that shows this kind of material about your small business will help get your following familiar with your brand and enforce your presence in their minds. Followers come to your brand because they like your product, identify with your mindset, or are interested in your content, anyway they are there because they’ve engaged with you in some way so you may increase that bond that ties you by sharing the spotlight. 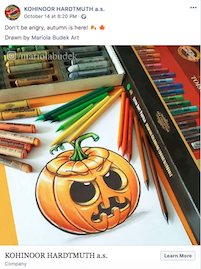 Kooh-i-noor, in this example, shared the work of an artist that used their products to do it, achieving a great sense of community while putting their product on the front of the Facebook post. People like to know that what their buying is legit, that the product does what it says and that they’ll get their money’s worth. Getting your customers involved in your small business and collecting reviews or testimonials is a great way to build trust with your following. A Facebook post idea would be to create pictures highlighting excellent reviews or making video testimonials from customers, you may even do small takeovers with loyal customers where they reply to the questions of potential buyers. Yeah, behind the scenes anything is trendy as curiosity is part of human nature, so people love seeing this kind of content. 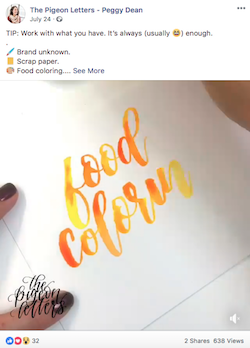 Below’s a screenshot a short video showing the artist’s process to create a lettering piece, it showcases both her artwork and her method to her small business followers. As I said before, we’re all curious about what happens behind the scenes and understanding how everything you do happens. Another great way to give your small business following an insight is by sharing information about the things that are part of your company’s culture that make it so great, maybe you have a slide in the office, you make great retreats, or celebrate accomplishments in a peculiar way that you may show through a Facebook post. 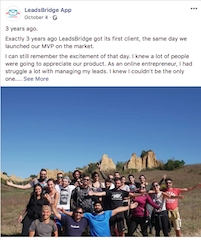 Let your followers get to know the team that makes it all happen, putting faces to your hard work humanizes you and creates empathy, which helps create a stronger bond with your customers; just simple pictures in your Facebook posts here and there would work wonders. 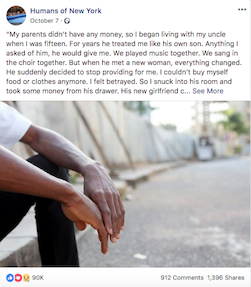 Every relationship is a two-way street so making things about not only your customers but also the community you belong to is a great way to engage with your followers, this kind of Facebook post may show the values and mindset of your small business. 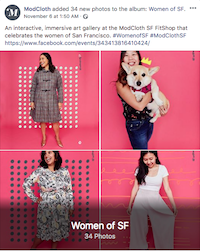 In the example below, ModCloth did a series of photographs showcasing the fantastic women in San Francisco empowering and supporting them. Show the activities you participate in and tell your following about it, keep them on the loop about what’s going on, and they’ll have a way to be even more involved with your small business. Another excellent post idea for your small business is to post questions about whatever relevant topic you come up with and either get the opinion of your followers or open up the dialogue and have an idea exchange that will strengthen your relationship with them. Bite-size content is perfect to maintain an active presence on Facebook, you may create posts that contain tips, tricks, ideas, advice, or any other kind of valuable information for your customers. 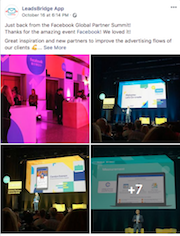 This type of content tends to be quicker to create and will allow you to keep up the interest in your business’ Facebook page. 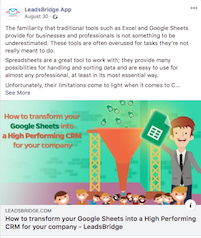 Blog posts are hard work and if you’re already using resources to have one then put those blog posts to good work by creating Facebook posts with them, this way you form a loop of information and make the best out of what you have. We always share our blog posts with our followers so they may get the information we work on and follow everything we make. What are your favorite Facebook post ideas for small businesses? Show us your best work in the comments.